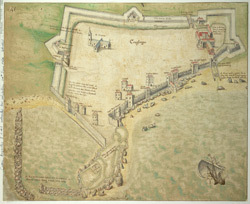 This is a plan of Carrickfergus in Northern Ireland. It is a 1612 copy of a plan drawn by Robert Lythe in 1567. The draughtsman has signed and dated the plan ‘John Dunstall pinxit 1612’. Pictorial in style, the map shows the improvements to the defences of the town which include the construction of a pier to form a harbour.